Free tours, Free Jazz, Free Dancing, Free Movies - New York City has it all! New York is a people-packed, adrenaline-charged, "love it or hate it" city that holds immense romantic appeal for visitors. Wandering the streets, you'll cut between buildings that are icons of the modern age — and whether gazing at the flickering lights of the midtown skyscrapers as you speed across the Queensboro bridge, experiencing the 4am party life downtown, or just wasting the day on a Staten Island ferry (free), you really would have to be made of stone not to be moved by it all. There's no place quite like it. The maverick quality of the city and its people, combined with its "nothing quite like it" aura, makes New York a unique and fascinating place — one you'll want to return to again and again. You could spend weeks in New York and still barely scratch the surface, but there are some key attractions that you won't want to miss. There are the different ethnic neighborhoods, like lower Manhattan's Chinatown and Little Italy — as well as the more artsy areas like SoHo, NoHo, TriBeCa, and the East and West Villages. Of course, there is the celebrated architecture of corporate Manhattan, with the skyscrapers in downtown and midtown forming the most indelible images. There are the museums, not just the Metropolitan and Museum of Modern Art (MoMA), but countless other smaller collections that afford weeks of happy wandering. In between sights, you can eat just about anything, at any time, cooked in any style; you can drink in any kind of company; and sit through any number of obscure movies. The more established arts, dance, theater, music, are superbly catered for; and New York's clubs are as varied and exciting as you might expect. And for the avid consumer, the choice of shops is vast, almost numbingly exhaustive in this heartland of the great capitalist dream. If this is your first trip to New York, face the facts: It will be impossible to take in the entire city. So decide on a few must-see attractions, and then let the city take you on its own ride. Here are some of the highlights we would recommend. The CityPass may be New York's best sightseeing deal. Pay one price ($45, or $39 for kids 12-17) for admission to six major Big Apple attractions: The American Museum of Natural History (admission only; does not include Space Show); the Solomon R. Guggenheim Museum; the Empire State Building; the Intrepid Sea-Air-Space Museum; MoMA QNS (the Museum of Modern Art's temporary home while it undergoes renovation); and a 2-hour Circle Line harbor cruise. Purchased individually, you'd spend more than twice as much. If you begin your sightseeing on a weekend or during holidays, when lines are longest, online purchase may be worthwhile. Plans for a crossing between the city of Brooklyn and lower Manhattan dated back to the early 1800's. When the East River crossing was planned, Brooklyn, with about 400,000 residents, was still more rural than urban. 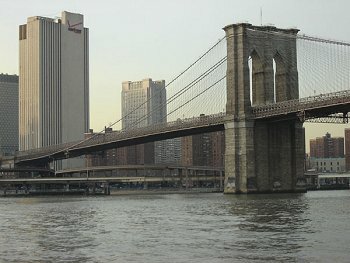 The city of New York - which at the time consisted only of Manhattan - had twice as many residents, and the bridge was seen as a solution to overcrowding in Manhattan while spurring development in Brooklyn. The bridge would enable people and goods to cross the East River quickly, regardless of weather conditions. Walking over the bridge is a great experience on a beautiful day. If you're in the mood for a great workout, at a total length of 6,016 feet, we suggest you try it. Just down the block at the corner of Gansevoort and Washington Streets are the southernmost stairs to the High Line, the immensely popular linear park created on what was once an abandoned freight rail line. The High Line is a series of gardens, punctuated by a fountain and a few quiet lounge areas, creating an immediate sense of calm. The park seems to float above the noise and congestion below and will completely alter your perspective on the city. As the sun slowly sets the lights around the High Line and city, new views appear. Colors pop in a different way and the tone is a different kind of chill from the regular daytime experience. The summer offers a warm and serene perspective – the winter, a stark and quiet beauty, full of bare tree limbs and a cold wind. There’s the gritty side, there’s the flashy architecture side, there’s the historic side, there’s the Empire State Building side and then there’s the Jersey side. Sitting on rows of wood benches, visitors can look through an enormous window up the length of 10th Avenue, the cars and taxis roaring out from directly beneath their feet. Walk your way through a secret landscape of derelict buildings, narrow urban canyons and river views. It allows you to make entirely new visual connections between different parts of Manhattan, while maintaining a remarkably intimate relationship with the surrounding streets. Central Park is an oasis of green in the middle of New York City with over 800 acres of scenic views, playgrounds and ponds. Designed by Frederick Law Olmstead and Calvert Vaux, it was the first landscaped park in the United States. Chinatown is New York City's most famous and largest ethnic neighborhood. Although the Chinese originally immigrated to this area of the city, this neighborhood is now inhabited by a variety of Asian groups. It is a colorful and vibrant area of the city. Many shops offer bargains on clothing and leather. If you walk down Canal Street in the open markets where you can buy knockoffs of most anything and everything. Most of the Chinese restaurants can be found near Mott St., there are literally hundreds of them. Need a break from the congestion of Chinatown, relax in Columbus Park, or see the Buddhist Temple on Mott Street, which has a collection of over 100 Buddhas. Location: Lexington & 42nd St. In the summer of 1929, a "race for the sky" broke out on the island of Manhattan. Automobile tycoon Walter Chrysler battled Wall Street powerhouse Bank of Manhattan Trust Company for the title of world's tallest building in what many historians consider to be the most intense race in skyscraper history. In the spring of 1930, just when it appeared that the bank might capture the coveted title, a small crew jacked a needle-thin spire hidden in Chrysler's building through the top of the crown to claim the title of world's tallest at 1,046 feet. Not only was the Chrysler Building the world's tallest structure, it was also one of the most decorated office buildings in the world. Chrysler wanted "a bold structure, declaring the glories of the modern age" -- and he got it. He decorated his skyscraper with hubcaps, mudguards, and hood ornaments, just like his cars, hoping that such a distinctive building would make his car company a household name. Today, the Chrysler Building is recognized as New York City's greatest display of Art Deco, a decorative style characterized by sharp angular or zigzag surface forms and ornaments. Only four months after the completion of the Chrysler Building, the world's tallest championship title would be claimed by a new structure, the Empire State Building. New York's famous Empire State Building, a New York City Landmark and a National Historic Landmark, soars more than a quarter of a mile into the atmosphere above the heart of Manhattan. Located on the 86th floor, 1,050 feet above the city's bustling streets, the Observatory offers panoramic views from within a glass-enclosed pavilion and from the surrounding open-air promenade. The observatory is handicap accessible. The majestic art deco masterpiece and World-renowned landmark is the symbol of New York, and one of New York City's main tourist attractions, offering a variety of activities for its visitors. One can tour the Observatory 365 days per year, day and night, rain or shine for breathtaking views of Manhattan and beyond. Also, there are two restaurants, a sushi bar, three coffee shops, a drug store, a Hallmark card shop, a post office and two banks, in addition to the plethora of restaurants and nightlife activities in the surrounding area. Indoor/outdoor observatories offer spectacular daytime and nighttime views from 1,050 to 1,250 feet above Manhattan. Call for current schedule. Location: Broadway & 42nd St.
ESPN Zone is a combination of sports eatery, bar, entertainment and shopping venue. Live TV and radio broadcasts, special events and private parties are also hosted here. Great for kids! Location: E. 42nd St. & Park Ave.
Grand Central Terminal is one of New York City's most famous landmarks. The terminal opened in 1913, after about 10 years of construction. Over the years, the terminal suffered deterioration and possible demolition. But the city wasn't going to let Grand Central suffer this fate. In the 1960's, the terminal was designated an historical landmark, despite some serious opposition. In the 1990's, the terminal was completely renovated and is now quite the midtown destination. Grand Central Terminal is home to five fine restaurants, twenty casual restaurants, and about fifty unique specialty shops. The terminal hosts large public events in its 12,000 square foot Vanderbilt Hall. To see this great terminal up close, you can take a self-guided walking tour or a one-hour private guided tour. If you choose the self-guided tour, visit the Grand Central Terminal's official website to print out a great itinerary for your tour. If you choose the guided tour, be sure to book at least 2-3 weeks early. More information and booking options are found on the official website. And while you're in the main terminal, be sure to look up at the spectacular ceiling, an astronomical mural painted by Paul Helleu. Greenwich Village is an area of the city known for its Bohemian lifestyle. It is located between Houston and 14th Street. It is one of areas of the city where the roads lose the simple grid pattern. If you venture here, do yourself a favor and bring a good map to navigate the streets. It is a charming city area with lots of coffee shops, jazz clubs, bars, Off-Broadway theaters and many restaurants. If you like to people watch, it is great place to come at night at just walk around. Over the past few years the village has become a hangout for some of the Hollywood jet set, keep your eyes open. Relax, walk along Bleecker Street and explore! Enjoy Washington Square Park, a popular hangout for New York University (NYU) students and tourists. Try the Blue Note Jazz Club for that live New York Jazz experience. They also have a great Sunday Brunch. Above Central Park is the area known as Harlem, an area rich in African American history. Harlem has gone through a revitalization in the last 10 years. Former President Bill Clinton brought some attention to the area when he opened his offices here. Visit the Museo del Barrio, a museum that focuses on Latin American Art. The famous Apollo Theater is host to many famous entertainers. Visit the St. Nicholas Historical District and New York's oldest Black Church Abyssinian Baptist. Also worth a look - the Studio Museum. To the west is Columbia University, one of the best and oldest universities in the country. Also, Grant's Tomb can be found at W.122nd and Riverside Drive. Location: W. 46th & 12th Ave. The Intrepid Sea-Air-Space Museum is a favorite with the kids. One of the most successful, battle-tested ships in U.S. history is now one of the most unique attractions in New York City. Berthed on the mighty Hudson River in Manhattan, the Museum consists of diverse sea, air and space exhibits. Walk the decks of the historic aircraft carrier, tour a submarine and a destroyer, and experience an F-18 mission. Together with the destroyer U.S.S. Edson, the guided missile submarine U.S.S. Growler and over twenty-five aircraft visitors are treated to an inside look of life at sea, past, present and future. Available for conferences, dinners, and receptions on indoor and outdoor decks. Closed Mon. in winter. The Jekyll & Hyde restaurant is very popular with families from out of town. Waiters run around in safari attire, while the kids (and parents) roam the four darkened floors of the haunted house. Bathrooms hidden behind bookcases, portraits with moving eyes, talking skulls and more, are all quite entertaining, ending with a flashy floor show extravaganza when Dr. Jekyll turns into Mr. Hyde. Those who need a drink to deal with all of the excitement have over 250 beers to choose from, as well as the house specialty "prescriptions" (souvenir glass included). Reservations aren't accepted, so expect to wait in long lines on the weekends. Its worth the wait, though — Jekyll & Hyde offers great food, friendly service, and thrilling family entertainment to guests of all ages. Location: W. 62nd & 9th Ave.
Lincoln Center for the Performing Arts is the world's largest cultural complex. The 12 world-renowned independent resident companies that make up the Lincoln Center represent the very best in the performing arts today. It is America's first and largest performing arts complex. Daily tours include Metropolitan Opera House, Avery Fisher Hall, New York State Theater. Groups can enjoy 'Meet the Artist' events and discounts to Great Performers and Lincoln Center Festival series. Next to Chinatown located on Mulberry Street, you will find Little Italy, the Italian section of New York City. Little Italy is slowly shrinking due to booming Chinatown encroaching on its borders. Today, there are less than five thousand Italians living in Little Italy. During the fall the neighborhood plays host to the Feast of San Gennaro. The festival starts Mid September and lasts for 9 days. There's dancing, drinking and all types of great Italian foods. If you are in New York during this time you must check it out. Madame Tussauds, located in the heart of Times Square is sure to create magic moments you will cherish for years to come! Don't forget your camera, because you will definitely want the pictures to prove it. Madame Tussauds is open 365 days a year but call ahead for updated closing times. Blast off aboard a futuristic spaceship and land on Mars in the year 2112. A kind of B-movie sci-fi set, Mars 2112 will be a favorite with the kids. After your official Martian welcome to the Red Planet, prepare yourself for an incredible cosmic dining and entertainment experience. While your young space travelers get an adrenaline rush at Cyberstreet, the state-of-the-art interactive game center, you can visit the Mars bar — their Martian cocktails are some of the best drink specials in Midtown Manhattan. Martian rock formations rise from the floor, while a costumed cast of roaming aliens entertain the kids. Enjoy dishes like a Maine lobster and rock shrimp BLT in a sundried-tomato tortilla wrap and a roasted pork chop with vanilla-rum mashed yams and apple chutney. Fairly pricey, but definitely worthwhile since your kids will remember it for a long time. $15, $10 students and seniors, children under 12 free. Sun. & Tues. to Thurs. 9:30am-5:15pm, Fri. & Sat. 9:30am-8:45pm. Suggested admission $12 adult, $4.50 students/seniors, under 12 free (includes Cloisters on same day). Open Wed. to Mon. 10:30am - 5:30pm, Fri., 10:30pm - 8pm. $20; $16 seniors 65 and over with ID; $12 fulltime students with ID. Free for members and children under 16 accompanied by an adult. Fri. 4pm to 8pm, pay-as-you-wish. Wed. - Sat., 10:00am - 5:00pm, Sun.12 noon - 5:00pm. Suggested admission: $7, $4 students/seniors/children. $12 for families. Mon., Tue., Wed., 11 am - 5:45 pm. ; Thu., 11 pm - 9 pm; Fri., 11 am - 3 pm; Sun., 10 am - 5 pm; Closed Sat., and major legal and Jewish holidays. Admission: $10.00, $7.50 students, and seniors. Free for children under 12. Pay-what-you-wish on Thursdays after 5 pm. Open Sat, Sun, Wed.-Thu.11am - 6pm, Fri.1pm - 9pm. Adults $12.Senior citizens (62 and over) and students with valid ID $9.50. Members and children under 12 free. Group sales $9.50 per person. Pay-as-you-wish Fri. 6pm to 9pm. Operating Hours: Open from 10:00am to 10:00pm, seven days a week. The New York Skyride experience commences every ten minutes. The total experience takes approximately 20 minutes - this consists of a pre-show which is dedicated to New York City, a short safety video and then the simulator ride which takes 8 minutes. Great for kids! Conveniently located on the second floor of the Empire State Building, New York Skyride is an awesome aerial tour of New York City that sends you on a ride around, above and even below all that the City has to offer - and you feel the sights from the comfort of a specially equipped, motion simulated, big screen theater seat! Through the magic of advanced flight simulation, New York Skyride puts the passenger in the middle of the action. This techno journey is guided by comic Yakov Smirnoff and James Doohan, 'Scotty', from the original 'Star Trek'. This visual and motion simulation experience allows you to lift off from atop the Empire State Building, soar through the Manhattan Skyline, glide past the Statue of Liberty, play in traffic at Times Square, 'zoom' through Wall Street, and ride the stomach-crunching Coney Island Cyclone - all while secured into a seat which is part of a specially designed platform, synchronized to the movements on the wide 18x18 foot screen. The New York Skyride experience is complete with Comedy Central's depiction of New York City life through the eyes of comedians and native New Yorkers. The exit ramp of the attraction brings passengers to a themed souvenir and gift shop complete with memorabilia from New York Skyride as well as the Empire State Building and other famous New York City attractions. Starting from $18 per person. Home of the Rockettes and the world famous Christmas Spectacular. America's most popular entertainers have thrilled audiences at Radio City Music Hall since its doors opened December 27, 1932. Radio City Music Hall completed a seven month $70 million restoration in 1999. From the famed marquee to the seats and the ceilings to the carpets, the restoration returned Radio City Music Hall to its famed glory. Location: 5th Ave. & 48th St.
Rockefeller Center, one of New York City's top draws is located between 46th and 50th Streets from Sixth Avenue to Fifth and in 1988 was declared a national historic landmark. During the holiday you can skate under the enormous lighted Christmas tree. The NBC studios are located here, you can take a tour and see some of the sets like Saturday Night Live or Late Night with Conan O'Brien. The Today show is also shot at this location. Rockefeller Center is a fascinating combination of contradictions: at once futuristic and classical, with soaring buildings and underground tunnels, inspired by both hard-headed commercialism and philanthropic idealism. Below street level, the Center's buildings are linked by a pedestrian shopping concourse. This is an oasis of order in the heart of the busiest city in the world, a city within a city, functionally efficient and aesthetically elegant. The Rockefeller Center Tour starts from $10 per person. This tour operates sporadically between Nov. 24 and Dec. 25, so call for information. Want to impress your family and friends with a little known, but spectacular view of the New York skyline? Take them for a ride on the Roosevelt Island Tram. The tram costs $2 each way ($2 round-trip for seniors), and takes 4 minutes to traverse the East River to Roosevelt Island, where there are a series of apartment complexes and parks. During those 4 minutes you will be treated to a gorgeous view down the East River and the East Side skyline, with views of the United Nations and four bridges: the Queensboro, Williamsburg, Manhattan, and Brooklyn Bridge. On a clear day you might even spot Lady Liberty. The tram operates daily from 6am until 2:30am and until 3:30am on weekends. Some of the best shopping in the world, from the Upper West Side designer shops of Madison Avenue, down to Macy's at Herald Square there is something for everyone. If you have kids you they will love the collection of toys at FAO Schwartz or the new Toys R Us on Times Square, the biggest toy store in the world. Here are some highlights. Location: 3rd Ave. & 59th St. Location: 5th Ave. & E. 58th St. Founded by Frederick August Otto Schwarz in 1862, the first FAO Schwarz store opened in Baltimore, Maryland. We moved to New York in 1880 and our flagship store has been a landmark on Fifth Avenue since 1931. The most famous name in toys and collectibles, FAO Schwarz is the ultimate toy store for toy lovers from all over the world. Location: W. 34th & 6th Ave.
Now the World's largest department store, Macy's has come a long way since R.H. Macy opened his first store in New York in the 1800's. Home to fashion, home furnishings and the sponsor of the Thanksgiving Day parade each year. Location: 5th Ave. & 49th St.
Saks Fifth Avenue was the brainchild of Horace Saks and Bernard Gimbel, who operated independent retail stores on New York's 34th Street at Herald Square in the early 1900s. Their dream was to construct a unique specialty store that would become synonymous with fashionable, gracious living. The combined financial input of these great merchant families led to the purchase of a site between 49th and 50th Streets on upper Fifth Avenue. With the opening of its founders' "dream store" on September 15, 1924, Saks Fifth Avenue became the first large retail operation to locate in what was then primarily a residential district. By offering the finest quality men's and women's fashions, as well as an extraordinary program of customer services, Saks Fifth Avenue has become the byword for taste and elegance. Location: 5th Ave. & 57th St.
Tiffany & Co. is the internationally renowned retailer, designer, manufacturer and distributor. The Company's merchandise offerings include an extensive selection of fine jewelry, timepieces, sterling silverware, china, crystal, stationery, fragrances and accessories. Tiffany was founded in 1837 when Charles Lewis Tiffany opened a store in downtown Manhattan. Location: Broadway & 44th St.
Toys "R" Us Times Square, The Center of the Toy Universe™ , is the new Toys "R" Us international flagship store located in the heart of New York City's Times Square. The more than 30 million visitors who visit Times Square each year will discover that Toys "R" Us Times Square is much more than a toy store. The amazing 60 ft tall, indoor Ferris Wheel signals the start of a truly magical visit. And don't miss the larger-than-life experience of the 5-ton, 20 ft high, 34 ft long animatronic T-Rex. Sure to bring out the dinosaur lover in everyone! The 110,000-square foot store is guaranteed to delight guests with an unrivaled shopping experience, an unbelievable array of toys, the best in customer service, and one of the most amazing retail presentations in the world. Madison Avenue and Fifth Avenue are world-renown for their luxury-shopping retailers. This area is rich in options for the wealthy or those who enjoy window-shopping where the rich shop. Among the store located in this NYC shopping area are: Anne Fontaine, Barneys New York, Bergdorf Goodman, Calvin Klein, Carolina Herrera, Celine, Cerruti, Chanel Boutique, Chloe, Christian Dior, Donna Karan, Emanuel Ungaro Boutique, Escada, Gianfranco Ferre, Gianni Versace Boutique, Giorgio Armani, Givenchy Boutique, Gucci, Intermix, Krizia, Luca Luca, Nicole Fahri, Ralph Lauren, Roberto Cavalli, Saks Fifth Avenue, Salvatore Ferragamo, Takashimaya, Valentino, Yves Saint Laurent, Rive Gauch. SoHo, which stands for South of Houston Street, is at Canal Street, between Sixth Avenue and Lafayette Street. Once the home of factories and warehouse buildings artists flocked to this area in the 50's and 60's because of the cheap loft space. Although the rising cost of real estate has driven many of the galleries to Tribeca, pockets still remain. Find a variety of luxury stores in the SoHo area. Among the stores in this area are: Asp, Calypso, Ghost, Hedra Prue, Helmut Lang, Jeffrey, Katayone Adeli, Kirna Zabete, Kors, Language, Marc Jacobs, Mayle, Prada, Scoop, Takashimaya, Tracy Feith. Location: Fulton St. & Water St.
South Street Seaport is located in the heart of the financial district and is one of this city's top five attractions. Cobblestone streets, strolling performers and panoramic breathtaking views; this is one of those places you just never forget. A thriving waterfront community complete with breathtaking views and more than 100 shops, cafes, and restaurants. Here's New York's best freebie — especially if you just want to glimpse the Statue of Liberty and not climb her steps. You get an enthralling hour-long excursion (round-trip) into the world's biggest harbor. Grab a seat on the right side of the boat for the best view. On the way out of Manhattan, you'll pass the Statue of Liberty (the boat comes closest to Lady Liberty on the way to Staten Island), Ellis Island, and from the left side of the boat, Governor's Island; you'll see the Verrazano Narrows Bridge spanning the distance from Brooklyn to Staten Island in the distance. When the boat arrives at St. George, Staten Island, if you are required to disembark, follow the boat-loading sign on your right as you get off; you'll circle around to the next loading dock, where there's usually another boat waiting to depart for Manhattan. The skyline views are simply awesome on the return trip. Well worth the time spent. This is not strictly a sightseeing ride but commuter transportation to and from Staten Island so the boats run 24 hrs; every 20-30 min on weekdays, but less frequently during off-peak and weekend hours. Visitors can walk out onto the Statue's observation deck to see the panoramic views of New York City and the Harbor, and witness the Statue up close from her promenade and Ft. Wood. The Statue's crown is no longer accessible and the torch has been officially closed since July 1916. Ferries leave daily every half-hour to 45 minutes from 9am to about 3:30pm, with more frequent ferries in the morning and extended hours in summer. Try to go early on a weekday to avoid the crowds and long lines. Daily 9am-5pm (last ferry departs around 4pm); extended hours in summer. Ferry ticket to Statue of Liberty and Ellis Island $10 adults, $8 seniors, $4 children 3-17. Current Park Hours: Liberty Island will close at: 6:00pm. Last ferry departs the island at: 6:15pm. Location: E. 51st & Madison Ave.
St. Patrick's Cathedral is the largest decorated gothic-style Catholic Cathedral in the United States and has been recognized throughout its history as a center of Catholic life in this country. West of 5th Avenue is the Theater District. If you haven't been here in a while you will be amazed at the complete revitalization of the area. Many of the landmark theaters have been restored to their former glory. The MTV Studios draw a sidewalk crowd as well as the studios for Good Morning America. If you have kids you can stop by the biggest toy store in the world, the brand new Toys R Us. They have a huge Ferris Wheel right in the middle of the ground floor - the kids will go wild. Most of the great Broadway theatres are near Times Square east and west of Broadway. Be sure to check out the TKTS booth to get a good deal on shows. You won't get the hottest shows here but you can get some great deals. A few blocks west you'll find Restaurant Row, which offers many great restaurants in a single area. Many of them offer a fixed priced menu and cater to the theater crowd. When the New York Times erected a new building on 43rd Street at the turn of the 20th century, the neighborhood took on the name "Times Square." In celebration of the new building, the Times publisher threw a New Years Eve party. A decade later, theater, vaudeville and cabaret migrated to the streets nearby, attracting much tourism by the 1920s. But the market crash of 1929 led to a sharp decline in theater attendance, and to the transformation of performance halls into cheap "grinder" houses that screened sexually explicit films. In the early 1980s, the city made major efforts to restore the neighborhood to its former, more wholesome, glory. Gone are the seedy strip clubs and peep shows. There's ESPN Zone for kids, as well as Madam Tussauds (the world famous wax museum) on 42nd Street. The lights of Times Square and the spectacular neon signs are a real draw for tourists. Today it is the site of the most famous New Year's Eve countdown in the world. Location: Wall St. & New St. The Wall Street Financial District is an area at the southern end of Manhattan and is the heart of the financial District in Lower Manhattan. It includes Wall Street and the famous New York Stock Exchange. Tours have been suspended since 9/11, but the building is impressive enough from the outside to make it worth seeing. Also in the area you can find the New York Federal Reserve Bank or the Federal Hall National Monument for a bit of early American history. George Washington was inaugurated on these very steps. Down at the end of Wall Street is the historic Trinity Church. Founded in the 1840's, it is a great example of the Gothic Revival architecture. There is a graveyard on the grounds where many wealthy and famous New Yorkers are buried. It narrowly escaped destruction from the World Trade Center collapse. Near the US Customs House there is a Bronze Statue of Bull that makes for a great photo — if you can manage to safely cross the street. Located in Lower Manhattan's Battery Park City on the Hudson River, the World Financial Center is a unique focal point for private and public enterprises. Four office towers house the world headquarters of prestigious international corporations, including American Express, Merrill Lynch, Dow Jones, and Deloitte. Since 1988, World Financial Center Arts & Events has presented interdisciplinary arts programming with an emphasis on commissioned works, site-specific installations and premieres, year-round and free to the public. Public spaces connecting the office towers include the spectacular Winter Garden and the Courtyard, which have provided venues for many notable events. With its waterfront Winter Garden as a focal point, the artistic process is made accessible in a free, open and interactive manner to workers, residents and the broader public of cultural consumers. The World Financial Center features over 30 specialty shops, restaurants and services, including Banana Republic, Ann Taylor, Godiva Chocolatier, Eckerd, The Grill Room and American Express Travel. The dramatic glass-enclosed Winter Garden, the outdoor waterfront plaza with spectacular views of the Hudson River and the Courtyard make shopping and dining an unforgettable experience. Location: Church St. & John St.
Today, there is a gap in the skyline of lower Manhattan like a missing tooth in the otherwise gleaming smile of the city. The rubble has been removed and the debris cleared from the site which is now known as Ground Zero. Plans have been finalized for a new complex of buildings, public spaces and a memorial to fill this gap. For now, it is just a big open construction site in the otherwise cramped metropolis of New York City. We recommend that you visit St. Paul's Chapel on Broadway and Fulton Streets near Ground Zero. People, including friends and families of victims as well as international visitors, began leaving mementos on the fence in front of the chapel. The St. Paul's staff quickly erected a temporary wall on their front and side fences for all of the items. This "wall of memories" grew into an amazing impromptu memorial. People attached thousands of posters, flags, signs, mementos and personal belongings of the loved ones that were lost in the disaster. You could see messages of grief and condolence written in many languages. Visiting that wall of memories was a sad and moving experience. Unfortunately, the church has removed the wall and placed the mementos in storage. The church does offer an exhibit commemorating the many rescue workers that sought respite and solace in the chapel during the long cleanup operation. Viewing the World Trade Center Site, there is a viewing area, open 9am - 9pm, at Liberty Street and Broadway. Tickets are no longer required. Groups do not need to make special arrangements to visit the site. One of the best ways to see Ground Zero and to experience the World Financial Center neighborhood around the disaster site is by taking a professionally guided walking tour of Lower Manhattan. New York City Vacation Packages offers walking tours of Lower Manhattan every Saturday and Sunday morning at 9 AM. Their guide meets you at a midtown rendezvous near your hotel, and escorts you on the New York Subway to downtown Manhattan, then shows you many of the historic sights, and takes you to the viewing platform at Ground Zero. The tour costs only $15 per adult plus the subway fare. A temporary memorial to the World Trade Center disaster has been erected in Battery Park. The mangled centerpiece of the fountain that once adorned the plaza at the Word Trade Center originally known as "The Sphere for Plaza Fountain" now stands in memory of those who lost their lives in the September 11 attack. On the first anniversary of the disaster, an eternal flame was lit at the Battery Park Memorial. Eventually, a permanent memorial will be constructed at Ground Zero.